New York : Puffin, 2010. 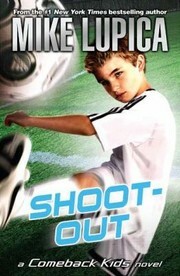 Twelve-year-old Jake must leave his championship soccer team to play on a team with a losing record when his family moves to a neighboring team. 100 ME:PersonalName $a Personal name Lupica, Mike. 245 Title 0 $a Title Shoot-Out. 520 Summary $a Summary, etc. note Twelve-year-old Jake must leave his championship soccer team to play on a team with a losing record when his family moves to a neighboring team. 650 Subj:Topic $a Topical term Soccer -- Fiction. 650 Subj:Topic $a Topical term Winning and losing -- Fiction. 650 Subj:Topic $a Topical term Moving, Household -- Fiction.